As we become more increasingly connected, it has become easier to identify digital trends across a myriad of industries – and oftentimes there is overlap. To further assess the landscape, we’re diving deeper into content trends and patterns we’re seeing in particular industries that are helping to shape and contribute to platforms like Instagram. In the case of this particular article, we’re setting our sights on fashion and its increasingly present role on Instagram. From emerging to established designers, we’re experiencing IG innovation from a truly global industry. Below are a few points that better speak to these key patterns that fashion brands of all sizes should take note of. From stop motion to illustration, there are many fashion brands using Instagram as a vehicle to test new ways of telling their story, premiering a product, and more importantly get people talking. Remember when Misha Nonoo premiered her SS16 collection via Instagram? This is a perfect example of a brand using a powerful tool like Instagram to get the message across in a timely and creative manner. Meagan Cignoli, a veteran in the Instagram video space is also a key player in helping brands craft compelling short and stop motion branded videos. You love the dress, but wouldn’t you love to know the best place to where it? Or what you should be doing while wearing it? It’s no longer enough for fashion brands to simply promote their products on Instagram, even if they are beautiful. Some of the most successful Instagram-focused fashion brands have crafted a layered narrative around who they are, and why their community should buy into it what they’re selling. Nasty Gal, is one of these brands and is leading the charge in empowering women to embrace their inner wild child when it comes to fashion, life and everything in between. This is evidenced in their feed as they are in tune with what their customers are looking for. THINX, an on-the-rise niche brand is also crafting an accessible lifestyle around their products as it’s something all women can identify with. Their kitschy, conversational, and educational content is sparking a necessary conversation and in turn has created a diverse feed that women from all walks of life can identify with whether or not they were intending to shop when landing on their page. 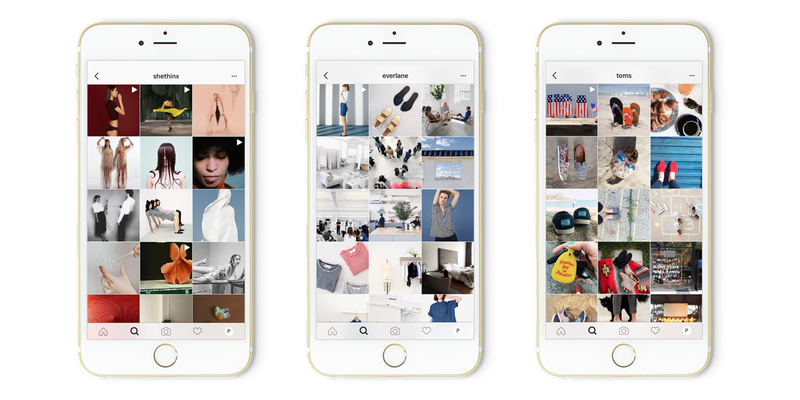 From Everlane to TOMS, many fashion brands are opting to use Instagram as a sounding board to share values-driven content that builds context around their products. Take Reformation for example – they have built a cult-following on Instagram by catering to their stylish community’s inner cool girl mentality. From posting their behind the scenes of their aspirational editorials, to #regrams from tastemakers and celebrities, they have been able to build a community of girls who are at the forefront of a new way of shopping – though you’d never know it. They are strategic when it comes to posting about sustainability, which is actually a huge core of the brand’s ethos, and in doing so, allow their quality product to lead naturally making their customers #jointhereformation. In turn, the educational aspect of their shopping experience is a choice, and there’s a power in that.